Danish shipping company A.P. Moller-Maersk christened, on June 2, its youngest container vessel, the Maersk Buffalo. 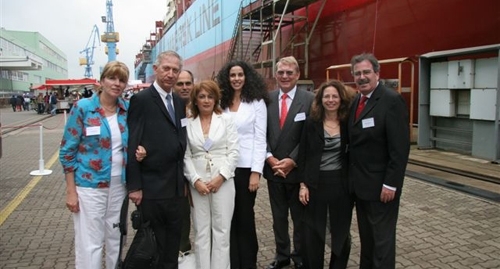 The christening ceremony which was held at Volkswerft Stralsund GmbH, the vessel’s shipyard, with the participation of several prominent Israeli representatives: Mr. Soren Hansen, director general Maersk Israel, Mr. & Mrs. Moshe Israel, Orian, Mr.& Mrs. Kobi Zaltsman, director Fritz Companies Israel and Mr. & Mrs.Shlomo Baharav, Northstar International. Also participated representatives from Savino del Bene, Transalpe, Santandrea, Aprile, Italsempione, Whirlpool, C & S Hellas, Akpa, BSH, Korman, Teknosa. The vessel was christened by Mrs. Alessandra Bucci, sales representative of Roberto Bucci, a shipping and forwarding agency with several offices in Italy and one in London, a close business partner of Maersk. The vessel is the fifth of seven Panamax type ships. It will operate along the Trans-Pacific – TP8 service.